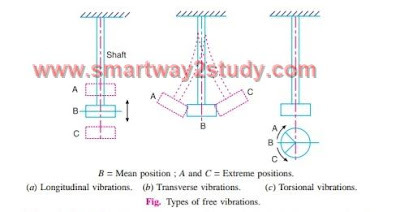 When elastic bodies such as a spring, a beam and a shaft are displaced from the equilibrium position by the application of external forces, and then released, they execute a vibratory motion. This is due to the reason that, when a body is displaced, the internal forces in the form of elastic or strain energy are present in the body. At release, these forces bring the body to its original position. When the body reaches the equilibrium position, the whole of the elastic or strain energy is converted into kinetic energy due to which the body continuous to move in the opposite direction. The whole of the kinetic energy is again converted into strain energy due to which the body again returns to the equilibrium position. In this way, the vibratory motion is repeated indefinitely.